You are here: Home / Great Deals / MUK LUKS Women’s Shelly Boots Just $17.88! Down From $65! MUK LUKS Women’s Shelly Boots Just $17.88! Down From $65! MUK LUKS Women’s Shelly Boots Just $17.88! Down From $65!Down From $40! Right now you can get this MUK LUKS Women’s Shelly Boots for just $17.88 (Reg. $65) at Walmart! 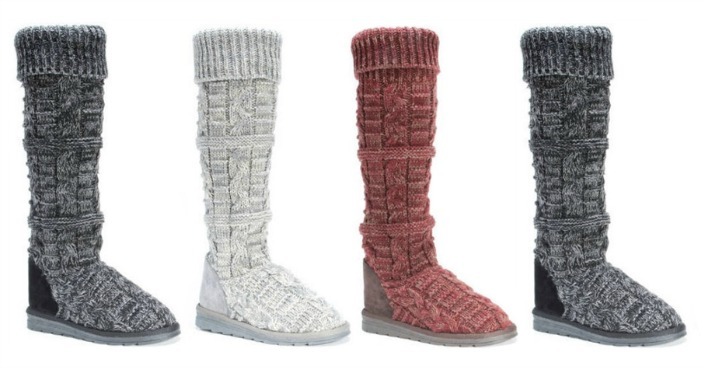 Keep your feet warm and toasty this winter season with these MUK LUKS Shelly boots. The knitted sweater overlay design covers the entire boot with a marled yard pattern. The Shelly boot has an outdoor water resistant durable sole to keep your feet dry on wet rainy days and a soft polyester inner to keep your feet nice and cozy. The pull-on style is easy and convenient, perfect for the women on the go. Pair with your favorite jeans or thick ponte pants and loose sweater for a cozy and comfortable look. Available in assorted colors.